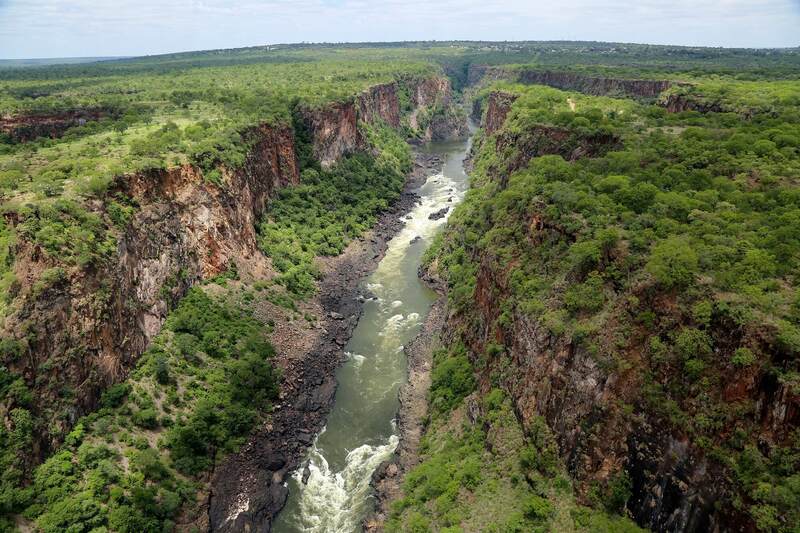 The Zambezi (also spelled Zambeze and Zambesi) is the fourth-longest river in Africa, the longest east-flowing river in Africa and the largest flowing into the Indian Ocean from Africa. The area of its basin is 1,390,000 square kilometres (540,000 sq mi), slightly less than half of the Nile's. The 2,574-kilometre-long river (1,599 mi) rises in Zambia and flows through eastern Angola, along the eastern border of Namibia and the northern border of Botswana, then along the border between Zambia and Zimbabwe to Mozambique, where it crosses the country to empty into the Indian Ocean. The Zambezi's most noted feature is Victoria Falls. Other notable falls include the Chavuma Falls at the border between Zambia and Angola, and Ngonye Falls, near Sioma in Western Zambia. There are two main sources of hydroelectric power on the river, the Kariba Dam, which provides power to Zambia and Zimbabwe, and the Cahora Bassa Dam in Mozambique, which provides power to Mozambique and South Africa. There is also a smaller power station at Victoria Falls.